I couldn't leave out Princess. Although the postal service where she lives is trying REALLY hard to do just that. Grrr. Can you tell I'm irritated? Hopefully it will miraculously appear before Saturday. Enough of that. 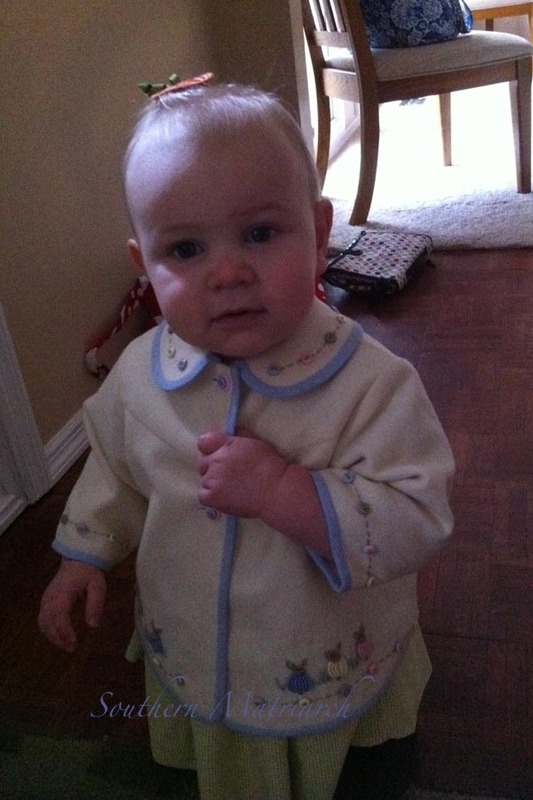 I used Gail Doane's little swing jacket. 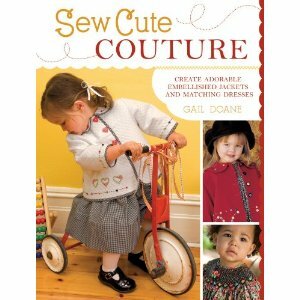 The pattern is available either in this book, Sew Cute Couture or as part of one of her many class kits. It fits great and looks great. As much as I love the hand embroidery featured on Gail's patterns, I didn't have time for that this time. 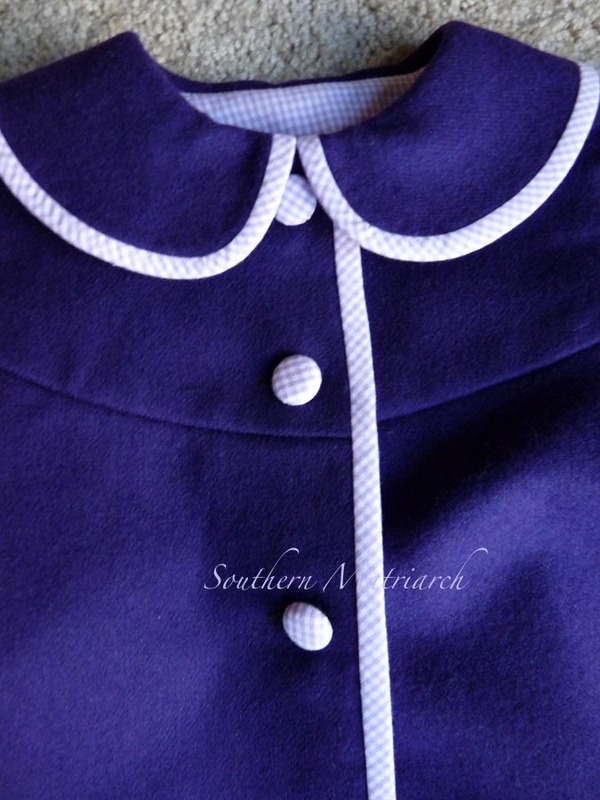 It is made of the same deep plum colored wool as baby brother's and interlined with flannel. So three layers ought to be warm enough. For the embroidery on the jacket front I used this cute little guy, again by Designs by JuJu. He is from the Christmas Owls set. 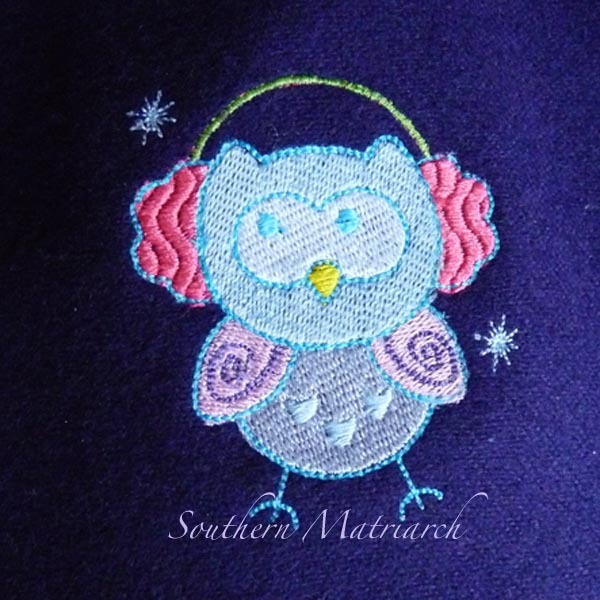 I like his little wavy stitched ear muffs. Sorry this picture is a little blown out. Even though the designs weren't overtly directional in appearance, I did mirror image them on either side of the jacket fronts. The sizing for this little pattern is generous. I expect that if it gets there before she goes to kindergarten, that the sleeves may be a tad long, so I lined the jacket in the same gingham I used for the binding. That way if her mother needs to roll the sleeves up, it will look intentional. Again I used gingham covered buttons to match. I didn't take a picture of my favorite part, the little swing pleat down the center back. So cute on a toddler. Where did this baby girl go? This was taken the day her baby brother was born. This is the third of these jackets I have done. 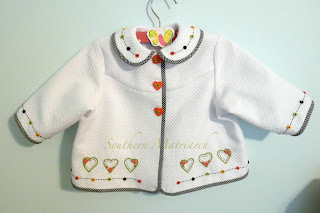 Plus, I may or may not have two kits upstairs for more of these sweet jackets, and another finished red one WITH a matching dress waiting for her to grow into made by my sweet friend Dawn. Can you tell we love this jacket? I wish I were prolific enough for her to have a matching jacket for every dress but alas I am not. Gail also has kits available on Etsy. 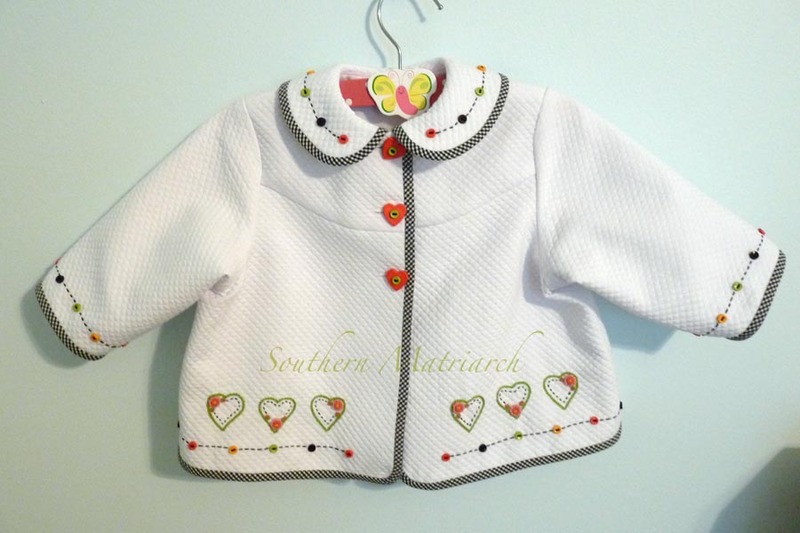 Try this little jacket even if you don't have time to make the matching bishop. 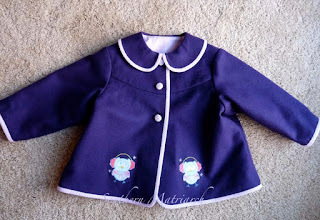 This little jacket goes together so quickly they are like Lay's potato chips; you can't make just one. Many have written asking about my shoulder. Thank you. It is coming along albeit way too slow for this impatient patient. The physical therapist is happy, we'll see if the surgeon is happy on Monday. I have grown so attached to my physical therapist, I don't know what I will do without seeing her three times a week. I see her more than my husband and children. Next up, the 25 yards of Santa fabric is pressed and ready to cut out today. Wish me luck. This one is beautiful too! I love that purple!! Praying that it gets to its destination soon. Both little jackets are precious! I love classic coats on children and these are not only beautiful, but practical too! I hope they do reach the Grands in time. What country do they have to get to? Have a lovely Thanksgiving with many blessings. Bravo! Just LOVE the purple wool... and the contrast gingham - Yum! I took Gail Doane's class at SOAF this past summer and LOVED every minute of it. 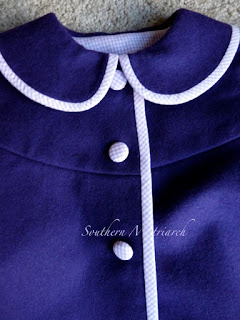 I've finished the Daisy Mae Bishop and need a few more hand stitches on the jacket so that I can construct them. Wonderful book with great patterns and technique tips. Loved your choice of Jacket fabric and color. 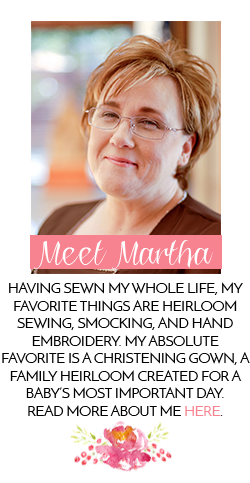 Be patient with your shoulder, I nursed my husband through shoulder surgery/rehab....don't overdo! Thanksgiving blessings! And just what are you making with 25 yards of Santa fabric? I am visualizing your entire family in Santa pj's on Christmas morning! Love the jackets. Jane you hit the nail on the head. Christmas pj's. The daughter who thought of this brain child wouldn't be caught dead in a minivan, too soccer-momish, but she has nooooo problem with matching Christmas pj's. We are the next Grizwalds.